There are over 8000 new cases of oesophageal cancer in the UK each year. 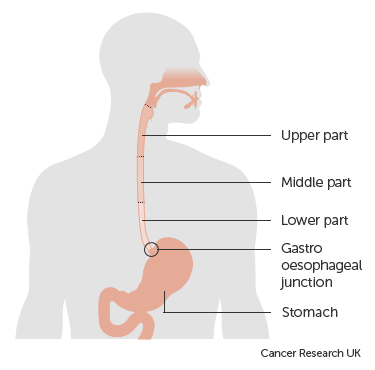 It is the 7th most common cause of cancer death, oesophago-gastric cancer is the 5th most prevalent Cancer in the UK. Adenocarcinoma - about 70% of UK oesophageal cancer cases, and on the increase. It is associated with Barrett's Oesophagus and the effects of stomach acid on the lining of the oesophagus. So anything that increases acid reflux, like obesity, can be a factor. It tends to occur around the junction of the oesophagus and stomach. Squamous cell carcinoma comprises about 30% of the oesophageal cancer cases in the UK. It tends to be higher up towards the throat. This sort of cancer is associated with high levels of tobacco and alcohol intake. If caught early enough, it can sometimes be successfully treated by chemo-radiotherapy and surgery. In an ideal world the OPA would be pushing the early diagnosis message for all the causes/symptoms of all oesophago-gastric cancers. We have decided, for now, to concentrate all our resources on the one message that will save most lives in the short term: do not ignore persistent heartburn. There could be tens or hundreds of thousands of people out there with undiagnosed Barretts Oesophagus. Up to 10% of them WILL go on to develop adenocarcinoma. The surest way to reach people who run this risk is to get those with persistent heartburn to see their GP. Many of those patients will be sent for an endoscopy which will diagnose Barretts, if present, leading to treatment and regular ongoing monitoring, both of which WILL save the lives of significant numbers of those patients. Symptoms above based on a survey of oesophageal patients in Q4 2016. 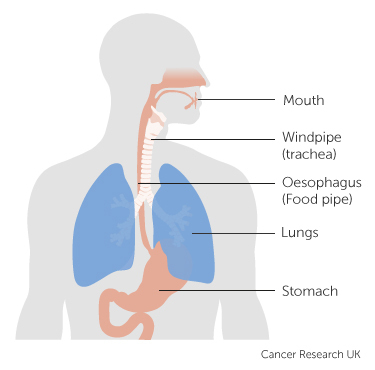 Oesophageal cancer is a cancer of the food pipe. Find out more about where it starts in the food pipe and how common it is. The foodpipe is also called the oesophagus or gullet. The oesophagus is part of the digestive system. It is the tube that carries food from your mouth to your stomach. Cancer can develop in any part of the oesophagus. Cancers in the upper part and middle part tend to be squamous cell carcinomas. These develop from cells that make up the inner lining of your oesophagus. Cancers in the lower part of the oesophagus tend to be a type called adenocarcinoma. These cancers start in gland cells. The lower end of the oesophagus joins the stomach. This area is the oesophageal gastro junction. Cancers that start here are oesophageal gastro junction cancers. These two illnesses are relatively unknown, but together they account for 4.4% of total cancer cases and – with their current low survival rates – 7.6% of total cancer deaths. Someone in the UK dies from oesophago-gastric cancer every 42 minutes. Only lung and bowel cancer kill more people.